I have something a little different for today's post. I've been tagged by Lola at Hit or Miss Books to talk about the books I have in my TBR pile. Rachel at A Perfection Called Books and Dana at Dana Square created this tag. I keep a To Read list on Goodreads like probably just about everyone else with a Goodreads account, but I also keep track of the books I own and haven't read or need to review with the iPhone app Weave. Not only does it proved a convenient list of To Read books right in my pocket, but it's also incredibly easy to use and lets alerts me when I set due dates for books I want to review by a certain date. You can check out Weave HERE if you're interested. It's mostly ebook, because, well, ebooks are so much easier to collect and store. I'd have no space to walk around my house if I owned print copies of all the books on my TBR! But my print TBR is growing since I started blogging three years ago, due to ARCs and giveaways and whatnot. The longest? 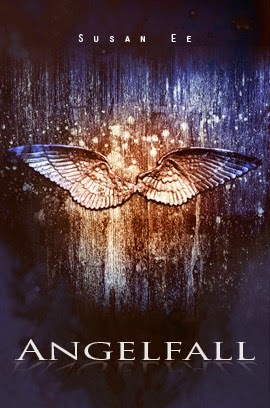 Angelfall by Susan Ee. It's been on my TBR since July 8th, 2011. You have no idea how many times I've almost bought this book. But I always remember just as I'm about to buy it that me and angel books, we don't always get along, and then I talk myself out of buying it and get something else instead. It looks good though! “It's been six weeks since angels of the apocalypse descended to demolish the modern world. Street gangs rule the day while fear and superstition rule the night. When warrior angels fly away with a helpless little girl, her seventeen-year-old sister Penryn will do anything to get her back. 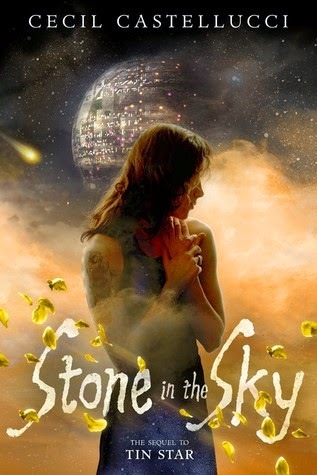 One of the last books I've added to my TBR is Stone in the Sky by Cecil Castellucci. It's the sequel to Tin Star, which I read and loved earlier this year. Space stations and aliens? What's not to love! “In this thrilling follow-up to Tin Star, Tula will need to rely on more than just her wits to save her only home in the sky. I was actually surprised there weren't more books in my TBR that are only in there because of the cover. 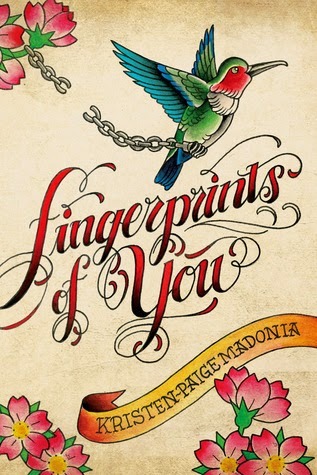 But I did find this Fingerprints of You by Kristen-Paige Madonia. I added it because the cover is absolutely gorgeous, but I don't have that much desire to actually read it. “Lemon grew up with Stella, a single mom who wasn’t exactly maternal. Stella always had a drink in her hand and a new boyfriend every few months, and when things got out of hand, she would whisk Lemon off to a new town for a fresh beginning. Now, just as they are moving yet again, Lemon discovers that she is pregnant from a reckless encounter—with a guy Stella had been flirting with. 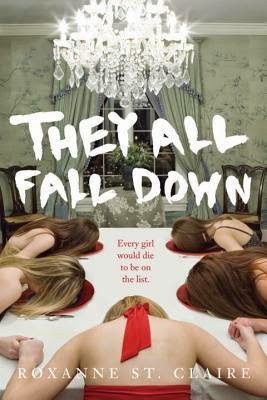 They All Fall Down by Roxanne St. Claire. I think it looks hilarious, but I don;t think I'll ever actually read it. I did read and enjoy Don't You Wish by St. Claire, so I guess there's hope that I'll read this one someday, but probably not. “"Pretty Little Liars" meets "Final Destination" in this YA psychological thriller that will have readers' hearts racing right till the very end! Uh, yeah. 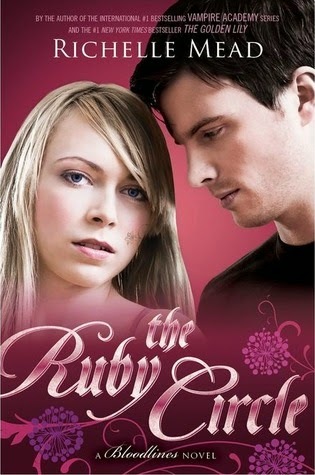 The Ruby Circle by Richelle Mead, no contest. If you've been following this blog for any amount of time, you know I'm compltely obsessed with this series and AHHHHH! After the things that went down in Silver Shadows I can hardly wait for February 10th! Though I'm going to be so, so sad when it's over. Fangirl by Rainbow Rowell. I feel like everyone has read this book (or, at least, one of Rowell's books), except for me. I own it, is the thing, I just haven't gotten around to reading it yet. “Cath is a Simon Snow fan. I feel like everyone recommends Splintered by A.G. Howard. I think it looks really cool, but I've been putting off getting a copy (despite that beautiful cover) because I'm worried about it falling into the usual paranormal romance love-triangle mold. Although, with so many people recommending it maybe I should just give it a try, huh? Aside from The Ruby Circle (which is the actual answer to this question), that would have to be Talon by Julie Kagawa. 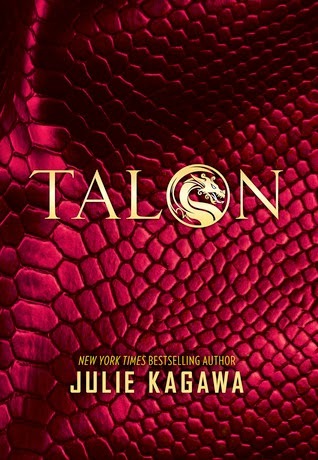 Because Julie Kagawa plus dragons cannot be a bad thing! “Long ago, dragons were hunted to near extinction by the Order of St. George, a legendary society of dragon slayers. Hiding in human form and growing their numbers in secret, the dragons of Talon have become strong and cunning, and they're positioned to take over the world with humans none the wiser. And you really should read Angelfall, it's not really like other angel books. Haha. Okay, next time I'm about to buy Angelfall (and there will be a next time because every time I see it I want it!) I'll stop talking myself out of it and just get it. You haven't read it either? That makes me feel better. it's like that time when I hadn't read The Fault in Our Stars and practically everyone else had... I'd totally be up for a read along to catch up. Reading buddies = motivation! 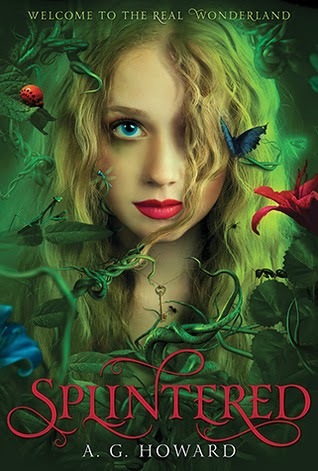 I'm going to join everyone and rec that you read Splintered. Such a good book and I came into it with hesitations. And Angelfall and Fangirl need to be read like yesterday! I'll give Splintered a try then :) It's nice to know someone else who was hesitant going in and liked it. I really need to read Angelfall. I have heard so many good things about this books!